PORTLAND, Ore. (June 7, 2017)  The 2017 Portland Rose Festival Spirit Mountain Casino Grand Floral Parade will feature marching bands from three states plus Taiwan, dozens of equestrians, and floral-covered floats including a creative section of "mini floats." The parade begins at 10:00 AM (Pacific) on Saturday, June 10. To reflect the 2017 Rose Festival theme "Brilliant," the Grand Floral Parade will be a colorful reflection of the local, regional and international communities that have enjoyed the Portland Rose Festival for more than 100 years. In addition to 13 marching bands, the parade will feature colorful dancing groups, flag-waving marching groups, and the festival's mascot: the Clown Prince. The Grand Floral Parade will be broadcast live on Fox 12 and PDX TV beginning at 10:00 AM (watch live online at www.kptv.com), with pre-parade coverage beginning at 6:00 AM. Curbside viewing is free of charge and available on a first-come, first-served basis. Reserved seating is available in Memorial Coliseum and in premium chairs and bleachers along the television area outside the Coliseum. The complete 2017 Grand Floral Parade lineup in order of appearance is shown below. Park Bureau Scooper - "Benny's Apples, Pears & Blueberries"
40-Something Cowgirls Scooper - "Poo Stew Cafe"
For more than one hundred years, the Portland Rose Festival has served families and individuals from Oregon and beyond with events and programs that spotlight the riches of the Pacific Northwest heritage and environment while offering colorful examples of many international cultures. Attended by more than two million people, the festival is annually one of the top three most highly decorated events by the International Festivals & Events Association (IFEA) and in 2011 was named Best Festival in the World (for the second time in five years). 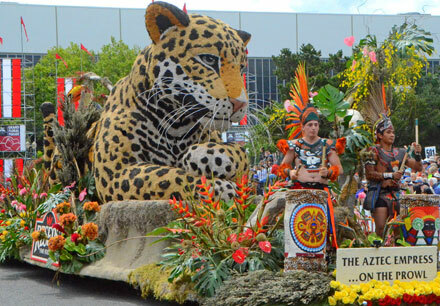 Among the festival's most popular events are the Grand Floral Parade and the Waterfront CityFair. For more information visit RoseFestival.org. Source material and images courtesy of the Portland Rose Festival.